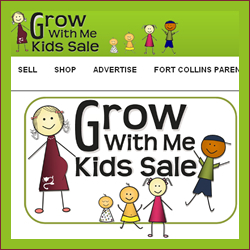 The Grow With Me Kids Sale is the largest sale of infant, kids, and maternity gently used merchandise in Northern Colorado! Thousands of quality outgrown items will be for sale Friday, September 13st, 10 am to 8 pm and Saturday, September 14nd, 9 am to 2 pm. Thousands of items 50% all day Saturday!